Learning about Google Analytics? We can help. "Google Analytics is a great tool"
"Complete tracking system and web stats"
Google Analytics I especially liked because it allows me to collect very useful data about my users in an organized and simple way, this data can be processed later by filtering tools in order to draw conclusions about what actions to perform on my website to improve the content and the way users browse the website. 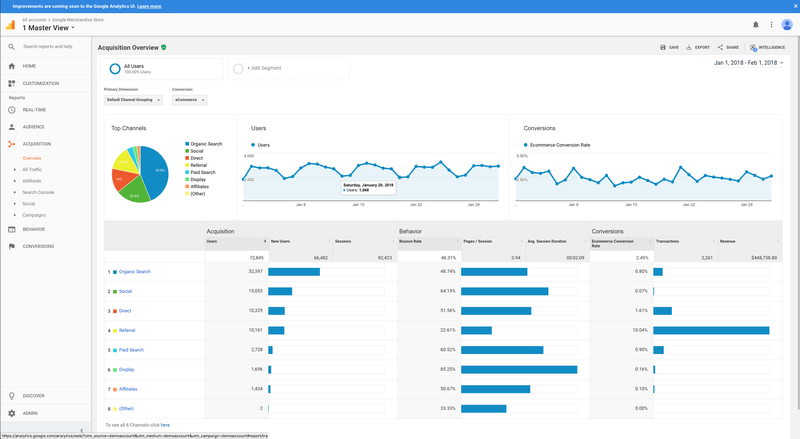 I also liked that this service integrates perfectly with Google Adsense of which I am also a user, so I can view the economic statistics from my Analytics account which are much more detailed than in the Adsense dashboard. And also, something very useful of the application, and for which many users like me use this service, its because its simple installation process that only requires registering in the Google Analytics site and then adding an HTML code in the head of our website. The only negative aspect that can be found in the application is that when you are new to the application the amount of options in the dashboard, filters etc ... can be very overwhelming especially for inexperienced users. Although the installation is simple I recommend that if you do not understand the operation of HTML hire a programmer for a reduced price to do the installation since you could delete essential content from the website and it would be useless. On the other hand I also recommend that when you have installed the application apply the corresponding filters to get the information you are looking for since this is one of the most useful tools of Google Analytics. We needed a service that would allow us to obtain information about the users that enter our website, especially information related to their country of origin and language in order to adapt the site to other languages. Thanks to Google Analytics, we obtained very useful data on what we could later work on. "A best tool to measure website activity "
We are using Google Analytics to measure activities on our website and to get our site SEO ready, the traffic and various other parameters are measured using this tool and we are very happy with their service as all of our need is fulfilled using this platform. We can analyze site behavior and take necessary action to make the site SEO ready. Also the major advantage is that we can get good insights of traffic from various locations on our site and then make it localized as per the need. The major disadvantage is with the real time data updating, as it takes a lot of time to update the data on to the dashboard. Please make this change asap. Very good platform to get insights about your website or app. "excellent tool to use on the website." It is a very essential tool, it is free and easy to install, you just have to have an email in Google (gmail), managing to analyze the number of visitors in real time on my website, keeping track of them. I recommend Google Analytics because it is an excellent working tool, which works to keep track of my visitors in real time and through this information you can make improvements on the website. the Google analytics tool has worked efficiently in my place of work since this program on my website has been very excellent for making improvements and keeping track of my visitors in real time. "it's great!! offers me all the analytics information on my website." This is really fabulous, what I like the most is all the exact data that it provides, it provides me with data and reports about everything that happens on my website: visitors, unique users, conversions, duration of visits, duration of sessions , how they have arrived at our website. So I have a broader picture of each of my visitors. really is very useful, you just have to make a good analysis of the data that this application presents, so that you can get the maximum prvecho to each data, I have not found anything that I dislike, it has helped me and without paying anything for that. very good alternative, if you want to know relevant information of your visitors from your website, which will help you make better decisions. "A best solution to analyze the traffic and other parameters on the website and mobile app"
Google Analytics is the best tool to manage, monitor and control traffic on websites and mobile app. 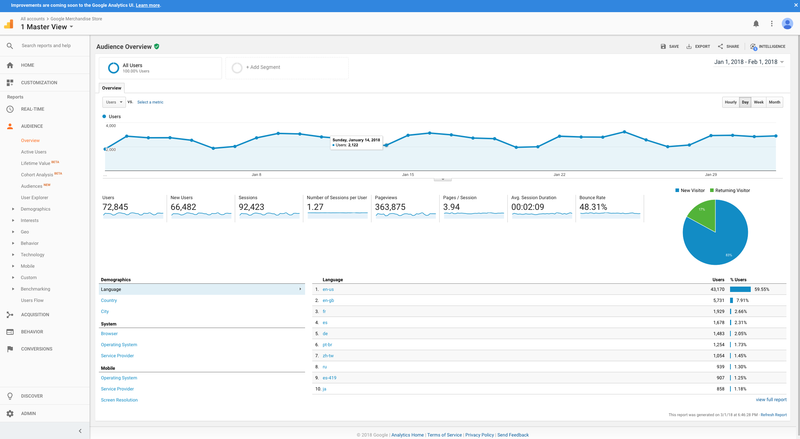 Google Analytics is the best tool to get a visualized look on how our app/website really works on the live and how the user is interacting with the app/website. We are using Google Analytics to get the details about our RightVows app and to make necessary changes to our app to fit the user needs. The main issue is with the dashboard, as it is not real time updating. The data gets updated only after a couple of hours and this is a major drawback on getting user data in real time. Please make the data update in real time on the dashboard. We are updating our app and making all the changes as per the user needs by using the Google Analytics and getting users data more efficiently. This tool helps us to improve our app and get more output from it. Also our app is tested by making use of the data got from Google Analytics. "Statistics of all kinds on your websites"
What I like most about Google Analytics is that it is a very simple application to install on your websites that you want to track, we simply add a script to our website through a few lines of code and in a few hours we have the site running . The application also allows you to manage and collect statistics from several websites simultaneously, personally I have tested up to 8 sites and I have not had any problems so I think it is unlimited. Being such a complete application at times, especially if you are new to the application, it can be difficult to find the information or statistics you are looking for since there are many menus and options or filters to configure. Personally I like to collect statistics of my sites to be able to improve them according to the users who visit my web and apply SEO techniques to improve the site and make it grow organically. It is also very useful to collect information about which countries or types of people generate more profits on my site, so I can improve and optimize the site for this type of visitor. "The solution to analyze your audience." This company fulfills an incredibly good function to analyze the traffic of my website, I love that in the reports it shows all the data that I need about my audience, one of my favorite reports is the one that indicates the behavior of my clients, the interaction that have with my website, because I can see what is the duration of stay on my site, the sessions and the number of visits to my page. I also like this platform is that it allows me to integrate them to almost all sales channels, such as Shopify or WordPress. I can insert it with the tracking code and then it will show me a lot of my clients' live data. This is an excellent tool to better develop the functioning of any website. I do not like that it was very difficult for me to use this platform when I started, it was very complicated to insert the tracking code since I did not have web development knowledge. My recommendation is to install the Google Analytics tracking code as soon as possible, it is very necessary to have access to the statistics and data provided by this platform, it is very useful to know the clients or to make advertising campaigns in Google Ads or in any social network. This company has helped me a lot to make a very complete follow up of my site, it allowed me to integrate it in Shopify and to know even more the behavior of my clients, besides I was able to collect data to be used in Google Ads. "Best way to keep informed on traffic and conversions"
What I love about Google Analytics is all the different ways I'm able to see my data in one place. I regularly need to check traffic numbers from specific channels to determine and report organic conversions or analyzing SEO results, report on PPC campaigns and Google Analytics has been a life-saver to collect and gather all these insights and more. Mostly, how difficult it is to understand Google Analytics at first. There's a steep learning curve but the good thing it's that you can go to Google Analytics Academy and learn all you need about Google Analytics and even get a certification. Make sure either you or all your employees or at least the people regarding your marketing efforts know and understand how Google Analytics work. 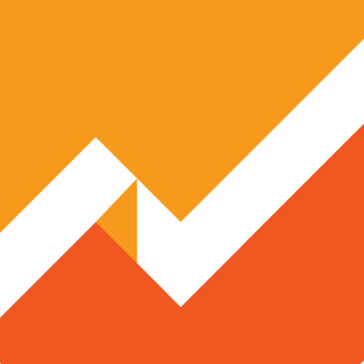 I strongly recommend you take the Google Analytics Academy certification. It explains everything you need to use this software effectively! In our company, we use Google Analytics to analyze and learn everything we need in terms of where our traffic and conversions are coming and we can do to increase or stop losing those numbers. Google Analytics is the base of our all marketing efforts in terms of planning and what we can do to increase sales or better improve our user experienece. Even if you're not an expert of the tool, you can monitor all your site visitors and general ups and downs in performance, traffic and conversions, paid or organic. "Know everything about your site "
"Google Analytics saves the day!" Google Analytics really helps our business find out what our site visitors are looking at. We can find out what are site visitors are doing in real-time, without invasion of privacy. Find out your top viewed pages, when, and figure out why with ease. Site visitor statistics via a graph, and you can also see Mobile and Computer based visits! I dislike the fact that there is so many tabs to navigate. Although these can be very helpful for business decisions and etc, it's hard to navigate and seems very cluttered to the average user. I only wish that is was a little more sorted and organized. Use it against your advantage! Get it and start rolling in your statistics, you can really get the feel for your site visitors and make great decisions on site changes, modifications and etc. Google Analytics also shows where your visitors are coming from - this is a major benefit for those who are doing E Commerce -- Gather your details, and get it going with the best analytic service out there. Best part is, it's FREE! There is no RISK taken by using Google Analytics. 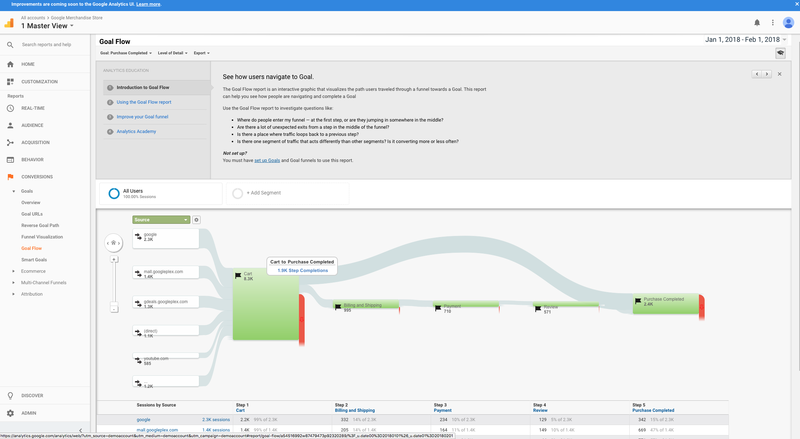 We can now see how users navigate on our website, their interests, and what they don't visit. We can tell how long they visit our site for and determine why they are staying so short or so long. Google Analytics is an organized platform that allows me to keep track of the many different ad accounts that I work on. I like that it has a variety of metrics that dive deeply into how, why, and who are contributing to our ad network. It is clear and provides a variety of graphics that make the metrics easier to process. Most importantly, these graphs and data can be exported for easy reuse to show our clients during reporting. The only problem I have with analytics is that it isn't completely user friendly. I am still attempting to learn the program. There is so much information that it is sometimes difficult to find the metric that I am interested in reporting on. I know that Google has other training sessions for the many applications that it has (Google Adwords, Search and Display training, etc.) but does it have one for Analytics? Make sure that you take the time to learn and play around in the platform. This is helpful when you start collecting data - so you know what to look for and how to segment the metrics. Analytics helps me and my team find concrete evidence about our advertisements to compile reports for our clients. This is the best way to determine what works well as an ad and what doesn't. Having all of this information and the ability to select specific time periods and other segments is the most useful aspect. The simple fact that we can segment by time, demographics like age or gender, and break it down by users or sessions, is the most important feature to finding out the how and why our ads our successful or not. ""Incredible Analytics Tool for Basic Needs""
Google Analytics is incredible on the grounds that you can invest days burrowing through your measurements, examining your advertisement crusades, and so forth. Or on the other hand in the event that you simply need a brisk review of how you're doing, where traffic is coming from, and so forth you can rapidly sign in and check only that. An extraordinary method to figure out how to successfully oversee promotion battles, Google Analytics is for the two tenderfoots and experts. We can likewise confirm the gadgets that clients are utilizing to speak with us among numerous different highlights, which help to find out about our clients and future clients. So far I have no issue with this apparatus. It is anything but ease to use on any site to track and screen guests immediately. We can see where our clients are coming from and better market to them with the information. You can see everything from the gadget type they use, to the OS and areas. Google Analytics enables me to monitor all the guest and traffic data for my and my customers' sites across the board place and is extremely point by point and complete. My customers need definite data about who is visiting their site and Google Analytics enables me to give them that data. As referenced over, the capacity to convey programmed reports to my customers is a noteworthy advantage also. "Google Analytics: The correct way to see statistics of your website." I really like this platform for my sites, very important data is obtained when using it, which we know are extremely necessary and important for the proper functioning of a website, such as demographic data, or the amount of time users spend On my website, or with what devices they enter, well, there are so many really important data that this platform gives us. Another thing that I like is that it can be integrated into many sales channels, such as Shopify or Wordpress, this makes us have better statistics and thus increase our conversion rate. I also love that I have a section to see live that my clients do when they enter our platform, in which section of the page they stay longer or if they have added a product to the shopping cart. This is really a fundamental tool to have a good web tracking. I do not like this platform that is not totally intuitive, it is very complicated to learn to use it 100%. Besides, it has so many options that can confuse the user, it is very helpful to have so many options but I think it is very complicated to learn when you are starting to use the tool, besides it is somewhat difficult to implement the tracking code on some platforms, It cost me a little when I started using it, but with a little practice you learn more, and it helped me a bit to learn more the free Academy they offer. Based on my experience, I recommend reading a lot before starting to use the platform, visit the Google Analytics Academy and try to learn there as much as possible before using the platform, as it is a bit difficult to use at the beginning, but it is very Useful. Install the tracking code as soon as possible, all these data are very important to make advertising campaigns in both Facebook Ads and Google Ads. It has been of great help to my company, it has allowed me to understand more what are the characteristics of my readers, it has shown me a lot of important information to be able to make successful advertising campaigns in Facebook Ads and also it has helped me a bit to collect information for Google Ads . It is a very good tool and I think it is very important to have it on any website. "Data Basics for the Business "
Google offers the basics for such a huge range of business development I can see someone never comparing another and another person not considering Google at all. I think we always have to consider that Analytics is always going to be limited no matter how well it may work in general. There are always outliers and things we missed and forgotten pieces. But Google continues to do a good job and maintain their standard practice of making the process of gathering data easy and intuitive. It's too easy in a way like all a sudden there is your information like they made stuff up. But I enjoy the streamlined process they have setup and don't see much reason to try another option considering my small needs are met well here and offer me insight and despite the continual randomness of the internet there's some method for moving forward. Expectations have to be kept in check. Even with a multi-billion dollar corporation like Google, there are many things they haven't figured out and offering feedback and any sort of definitive course of action based on analytics isn't going to happen. I hope that Google will soon be offering more analytics based on successful responses and outcomes towards other outcomes taken using Google's data. Offers the basic data we used to shell out big money for. Doesn't do anything magical or offer spicy ideas but provides the clean numbers and information many need for moving their business forward. Getting feedback on customer information especially time spent on my site and viewing my material as well as the comprehensive demographic data on the users and better ways to reach them and bring them to my store. "Google Analytics: The best solution for web tracking." Google Analytics offers me an incredibly huge amount of data necessary for the constant monitoring of my web traffic, I like that it shows all the necessary statistics of my visitors, this is of great importance for those of us who work in the world of digital marketing, it allows us to know where our audience comes from, which are the pages that interest them most, the length of stay on our website, the actions they take, everything, really, it has everything a person needs for a correct website tracking. One of the things I like the most is that I can verify if my web traffic comes in an organic way to my website or if it comes from advertising campaigns that I do in Facebook Ads, it has really helped me to understand the behavior of my visitors. As all software we will always find some disadvantage, in the case of Google Analytics is that it is a bit complicated to learn to use this platform, when you start and you have almost no knowledge of the area, you do not know how to install the tracking code on your site web, you do not know how to identify variable variables for monitoring, it is a bit complicated, but once you learn to use the platform you will see that it will be of great help to the business. If you need to follow up on your website, obtain all the data from where your traffic comes from, what your visitors do on your website and even see who is online using your website. Google Analytics is your solution. My recommendation is not to get frustrated when they start using the platform, I know it's a little complicated to learn to use it, but once you learn it is very important and good information that Google Analytics gives us, there is also the Google Academy, in case They want to learn faster how this platform is used, it will be of great help. It has allowed me to solve many problems of my company, before using the platform I did my advertising campaigns to promote some services of my company, also used strategies to increase the organic visits of my website, but I ran into the problem that ended the day and I did not know where my web traffic came from, I did not know if I was running the advertising campaigns or from my strategies to increase organic traffic. This has been very necessary for the growth of my website. "Provides us with all the vital tools we need for website monitoring"
The fact that Google Analytics is used with many major websites and websites in general gives me great confidence in using it. Google Analytics does a great job at updating the system to make it very efficient. Installing the Google Analytics code into our websites is very straightforward and not too complicated for a even a non-programmer with no coding knowledge to do. The data we receive through Google Analytics is easy to access and can be pulled up in real time. There are tools for us to generate custom reports and add multiple domains. There are lots of panels, tabs and menu items in Google Analytics that seem redundant. Working with all of the features can seem intimidating. Google Analytics isn't set up in a way where it's obvious what you should do with the information. I tried testing some readings on visit duration and location tracking, but the data wasn't always accurate or even present. I don't see why any organization, large or small, wouldn't strongly consider using Google Analytics. It seems like it's in most websites I visit. Even if you're considering other solutions, it won't take long to install and try out. By using Google Analytics, we are able to track visitor activity and information in real time and with thorough reporting capabilities. We don't have to dedicate many of our own resources, whether it's employee monitoring or technical web resources. Most of the data processing is done through Google, which minimizes performance issues on our servers. "The Pros & The Cons of Google Analytics"
- The component of Google Analytics allows you to utilize the basics of the application for free. - Google Analytics allows you to determine the conversion rate of your online web store. Google Analytics is a revolutionary tool business owners can utilize in order to figure out where the traffic is originating. In addition, it allows business owners to find out what keyword terms were used to be directed to the web page. - Google Analytics allows you to analyze your content performance and monitor the performance of your advertisements. - You can use Google Analytics on mobile devices including Androids and iPhones. - The usage of Google Analytics requires constant training because the user interface is constantly being updated. The changes are sometimes fairly substantial as new features are being introduced and old features are either being combined or completely discarded. Users are required to keep up with Google Analytics’ constant updates. Google Analytics helped us optimize our clients' business process. "Not very intuitive, but very thorough"
I love that the service is run by Google, because it is an internal process. It is great for learning where your traffic is coming from, how long they are staying, and which pages they are listing. Also, you can see your numbers related to how many people are visiting per day. If you are running campaigns or if some other event is taking place which could affect your traffic, you will be able to see the results. This is great for assessing your efforts to bring people to your site. I dislike that the service is not intuitive. Even after watching tutorial videos, it was still difficult to set up everything. From time to time, Google changes how things are displayed and it forces me users to defamiliarize themselves with the new layout. Don't worry with third-party analytics options, because Google is the best expert on their own traffic. They are constantly upgrading the service and providing more detailed information. In my opinion, using anything else is a waste of time. Google Analytics provides incredible insight for my traffic. In my opinion, Google is the leading search engine. So, using their analytics is the best way to stay current with any changes that they implement. Third parties have some great services, but they will always be a step behind. I need to stay current, so Analytics is the best option for me. Easy to use and install . Flexibility of software for every work day and you re request.Ability to sort and filter what you would like to . 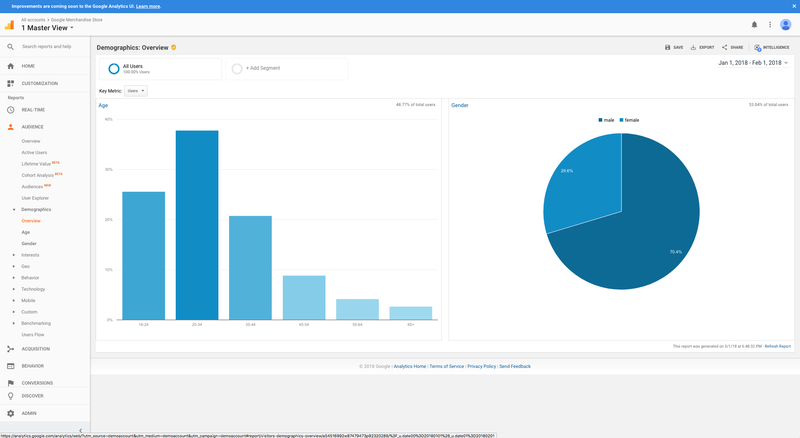 Analytics have almost UNLIMITED custom dashboards and graphs variety . Software allows you to connect and share with you re customers or you re employer. AND my favourite part ITS FREE . Google have best supports in my opinion. Google analytics is not intuitive , Can be difficult to find needed sections and navigate fast throw in first day.Hard to track info because sometimes servers not responding and showing no info. Worst thing that keywords not working and not supported fully. a lot of errors and data loss happen to me while working with google analytics, allot of not supported features that have other competitors softwares . Just try it and make a conclusion. we was tracking info about our customers and visitors count to percent of potential buyers chance . Google analytics fully supported us and helped to improve search engine. — Restriction on the depth of access to data (there is no possibility to track each specific visit or each specific click). — Inability to extract statistics from the database. For example, if you want to use another system, you will not be able to transfer data from Google Analytics into it. Updates are constantly being released, the service is improving, which is good news. If you have your own website, then you just have to connect Google Analytics to it. I neglected this service for a long time and used Yandex.Metrica exclusively. And in vain. No matter how obvious it may sound, Analytics gives a clearer and more detailed picture of visitors from Google. I think it’s not necessary to explain that Analytics is not just a counter like LI, but a complete system for analyzing your traffic, helping to find errors of your resource in a timely manner. In general, if not connected, then urgently correct this mistake. "Great Analytics Tool for Basic Needs"
I love that Google Analytics easily integrates with our e-commerce platform. I much prefer the reporting and analytics tools it has to offer. I also like that I can integrate my AdWords account so all of my data is in one centralized place. There really isn't much to dislike about Google Analytics. It is an awesome, free analytics tool that really helps out small businesses that want better insight into customer behavior, advertising ROI, website performance, etc. My only complaint would be that it is overwhelming to learn, but Google offers a wealth of educational resources you can leverage to become an expert. It's just on you to actually use what's available to you. Definitely go through the certification process. Also, read any guides or watch any videos Google has created. It would also help to check out some webinars and meetups. There is a lot to learn, but once you learn it, you'll see the benefits. Google Analytics is giving us better insights into which of our advertising campaigns our performing best and which web pages are most effective. It's also giving us a better idea of the journeys our customers are taking before converting. "Review regarding the Google Analytics "
google analytics is a completely free tool for users. though there are some paid service that may offer more, google analytics is the one that suitable for those who just start their websites and want to manage who are visiting their website. it is also very useful to track purchasing activity and calculate drop rate by setting multiple goals inside. you can track who bought your product, who added your product to the shopping cart but turn out did not purchase. or those who just visit and did not add anything. First of all It is completely free of cost and It can track user location, real-time users, sales funnel . can check the stats on how your visitors locate your website. Identify which pages and links your visitors click the most. You can create custom reports based on your needs. This way you can track specific information depending on your industry. You can also collect data from different platforms and sources. can create custom goals and you can also track your ecommerce platform. Use this report to see which pages your client’s visitors land on when they first visit the website. If the report shows higher bounce rates on certain web pages, use this information to make these web pages more engaging. Compare the bounce rate (the percentage of visitor who didn’t take action after viewing just one webpage) with the exit rate (the percentage of visitors who browsed 2+ pages on a website before leaving) to isolate UX problems or find pages with lower engagement. To understand all the intricacies, you need to learn. The issue with that is that the information is sometimes hard to find, may be confusing, and overwhelming. The academy is also quite time-consuming so if you’re on a time frame, it my not be feasible. overall feel of the platform might also be a little bit overwhelming. There are too many dashboards and too many things to look at. "Gets the Job Done and All for Free"
What I like best about Google Analytics is that it is a free service. It is an invaulable tool if you are running a blog or website. It gives you a lot of information about how much web traffic you're getting. It also offers a look into your audiences demographics. Plus you can get an idea as to how visitors are coming to your website. Such as from social media channels, direct links, other websites or from organic searches. It goesd well with Google Search Console for figuring out what keywords people are searching for to come to your website, as well. And you can get keyword ideas, too. I dislike that it's not always 100% accurate. I get slightly different traffic readings from other sources. So I'm not sure which one is measuring correctly. This is a great analytics tool for beginners and advanced users. You can really do a lot with it, you just have to know how to do it. I am using Google Analytics to keep an eye on my businesses website traffic. I use it to see where we can improve our reach to get more people on the website. I also use it to find my best performing content on Pinterest so I can see which pins people tend to like best out of the designs I try. I then repin that same content to help it gain even more traction. I like how many features you are given from the start. The website allows you to filter to much information from things such as location, Traffic on your website, Clicks on your website, The kind of content being looked at the most and many many more options. The crazy part is that you are even given real-time data as your users are navigating the website. I also like that Google themselves have google reps that can literally walk you through the entire process of setting up Google Analytics and helping to implement it on your website for people who may not be very tech salvy or even for people who just wished to have someone hold their hand. Google Analytics can be and still is very confusing at first since. Navigating the website is also very daunting since you are bombarded by a million options and filters which is also great at the same time but only once you know how to use most of those features. Google Analytics works very well and I recommend getting a hold of your Google Account Manager to help you better understand the power of the software, also to help you implement the Google tag on your website and lastly to help you navigate the website for basic filters and functions. We are using Google Analytics to find out how many people are navigating to the company website. We are also learning where location-based are most of our clients based. It helps us better create advertisement to target clients in particular areas around the globe or as simple as targeting a small group of people based of age if we wanted too know that much information. "I Like It But I Would Not Pay For It"
I like Google Analytics because it is a great way to see a quick overview of the performance of your website and you can drill down into very specific analytic details. You can evaluate traffic acquisition by channel and dive into each channel viewing details about almost every visitor. The thing that absolutely drives me crazy about Google Analytics is their insistence on not turning over 100% of your data. What's worse is that sometimes Google will give you 90% of your data and sometimes they will only give you 60% (or so) of your data. They use the category "other" as hidden data. I have no idea why they do this but it is impossible to gain a complete understanding of your web analytics with this tool. But, it's free so it's hard to complain too much! If you intend to completely understand your business analytics then this product is simply not enough. You will need to supplement with another business intelligence product to get the full picture. I am able to understand the daily traffic, conversion, and behavioral dynamics of my website, This helps me determine the best way for me to allocate my marketing spend and how to schedule my web promotions. "Great Tool For Website Analytics"
We utilize this product once a day to survey information and help us settle on choices about where to center our showcasing endeavors, particularly with social. It enables us to accumulate data on socioeconomics, which is incredible for advertisement focusing on, particularly when you likewise utilize the Google Pixel which gives transformation information. It enables us to accumulate KPIs for different crusades just as track the achievement of our influencers battles in mix with Google Tracking URLs. We have likewise discovered that the Google Data Studio, which draws from Analytics, is a standout amongst the best approaches to make shareable reports that can be controlled rapidly and effectively for explicit gatherings of pages, which is incredible for us as we have various fragments with various target groups of onlookers. While it can require a significant stretch of time to figure out how to explore Google Analytics, there are incredible assets online to support you. You can follow client conduct which is extraordinary in figuring out where enhancements should be made in your purchasers venture. It can require investment to figure out how to control Google Analytics so it furnishes you with the data you need however once you make sense of it is an incredible apparatus. Definitions should were inherent. There are numerous terms I was new to and I needed to do online hunts to get illumination. Google Analytics is an incredible instrument for estimating the achievement of your showcasing endeavors just as better understanding your groups of onlookers and their social streams. It can require some investment to adapt however once you get its hang, drawing out the information you need is basic. I really like the pie charts and visuals I can provide to clients. 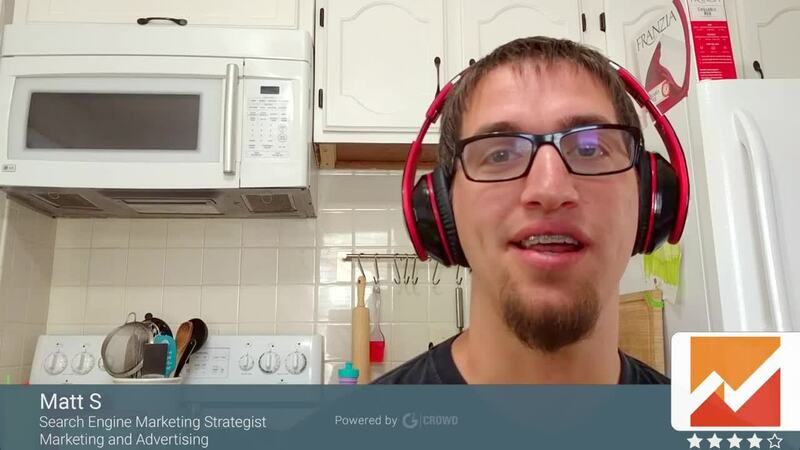 I use it to make annotations as to when we launch various campaigns so we can compare quarter over quarter and year over year what tactics seem to be driving traffic and conversions and which tactics aren't working as well. I also like being able to view length of time on page, entry and exit pages and mobile usage vs. desktop. With mobile taking over web browsing, it really helps to know how well our pages are performing on phones, tablets, etc. I don't like not being able to see the majority of our top search terms. The bulk of the terms are lumped under an "unavailable" category. That's incredibly frustrating. Maybe it's because we're using the free version, but it seems less than helpful to withhold valuable information. Another feature that would be excellent is a notification if your site is no longer tracking. We had a site with a Wordpress update that blew up the tracking code and for nearly 6 months, we didn't have any data tracking and when our client came back to us asking for stats, we couldn't provide them. That's our fault for not checking, but it would have been nice to know from Google with an email or an alert of some kind. Google Analytics is helping us provide insights into how our client websites are performing, how we can improve and ultimately, how well business is performing because of the traffic that generates leads and conversions. "A perfect tool for SEO persons and Digital marketers"
Google analytics tells about almost all the thing related to your website. It tells you the real time user reports such as number of user on your website in real time and also on which pages they are browsing, what they are searching for. It also tells all about the traffic which is coming on your website that whether it is paid, organic, direct, social etc. It also tells what is the source of the traffic, their geographies and other details as well. whether the traffic is coming via desktop, tablet or smartphone. also the security is very high, no body can claims a website just like that and also you can link 50 websites with one link. You can also know more about on which webpage the traffic coming by which keyword and their bounce rate also. it takes a lot of time as some times couple of days in fetching the data for a website, and also the data collected is an average, some time not accurate. it could have been better if the date shown is more accurate. Google analytics is highly recommended to the professionals related to seo, digital marketing, mobile app marketing, optimiser, bloggers etc. I am using google analytics to get insights of the website, so accordingly planning the further steps to how to increase the traffic towards website. it helps me focusing the platforms and sources by which the most traffic comes from. It's safe, Google promises to take care of the privacy of your data by being aware that the web analysis data are part of the confidential information, so they are given complete protection. It is not possible to reprocess the information: you have to be careful when tagging campaigns, create filters to segment information in profiles, etc ... Any error can cause the data not to register correctly. And the data can not be reprocessed; If they are lost or not registered correctly, nothing can be done to recover them. The same would happen if the tracking code of any of the pages on the website were deleted. "Excellent tool for analyzing your brand on internet." 1. The effective use data is essential at the moment that organizations must make decisions, google analytics puts at your disposal digital analytics features that allow a quick and effective analysis. 2. Its free version is extremely powerful allowing me to improve the organization's results for which I work. 3. The analysis results allow us to have a clear concept on where to focus the company's marketing. 4. It helps to improve online experience of our potential clients. 5. Analytics is one of the easiest to use. 6. Graphics availability in sections: *Overview / * Groups analysis. / * Demographic data. It is not possible to reprocess the information: It is needed to be careful when tagging campaigns, create filters to segment information, etc. Errors can cause an incorrect data register. * Useful to evaluate your web environment. * Flexibility in analyzes configuration. * It allows to define effective strategies in marketing segmentation. * It allows you to process your data effectively. * Availability of multiple features that allow to know a little more about the visitors to the site and establish trends. 1. It helps us correct mistakes in the marketing strategy. 2. We know more information about our potential clients such as location, time of consumption, tastes, connection devices, etc. 3. It allows our products to adapt to the market focusing on those that generate more interest in our potential customers. 4. Availability of qualitative and quantitative online data analysis of the market in which our brand is moving that help our team to understand our potential clients. "Google Analytics is a MUST HAVE technology for any company. " The most helpful aspect of Google Analytics is being able to see, in real time, how effective our sales & marketing activities are. Hard data to support assumption is extremely important to the success of any company. It is a little bit complicated which increases the learning curve for any new member of our team. Also, if a user blocks cookies it is a pointless activity because no data will be tracked. Do your homework and be continually learning more about how GA works. Also, use the data to improve your processes and validate your assumptions. This is the best tool for that. Bringing hard facts to our assumptions about our sales and marketing activities. It is hard to argue with the data! We are then able to pivot our activities to the most productive and cost effective efforts which then increases our ROI. "If you're not tracking your site's visitors, bounce rates, and page views your missing sales!" I like that google shows you the bounce rate and the number that pages were viewed and how long people stay on a single page. This lets me see if a page isnt getting many views then I can create links to it on a page that does get alot of views or if people only stay a short amount of time on a certain page then I know I need to work on the content of the page to keep viewers interested. under traffic channels it tells me when traffic comes from social media but it would be great if it could tell me which social media platforms the traffic is comming from this way I know which platform is performing better and can put more ads on that one. If you want to know which pages you should put the most effort into or if you want to know how people are reacting to your site google analytics is definitely the way to go! I'm currently tracking how my ads are performing using google analytics. Before them, I would put up ads and just use a FB pixel but i couldn't tell which landing pages were performing better. Now I can see which ones have a lower bounce rate and how long people stay on each page.